Leveraging the power of social enterprise to build sustainable schools and communities. Manjeri partners with local leaders in remote communities who are passionate about education in their communities. They work with them to build high quality schools that are 100% sustainable within a set time frame. This is achieved by investing in social enterprises that cross subsidise the school and ensure that it can support itself well into the future. In previous years, Manjeri stepped up to present at TFN Sydney in November 2014, raising $17,957 in support of social enterprise in Uganda, and separately over $100,000 in subsequent and multi-year funding support from other donors and successive network advantages that are still operating over a year later to help this youth-led organisation grow. The money raised in Sydney was put towards the purchase of a Toyota Hiace to launch a ‘matatu’ taxi/bus social enterprise in Uganda. The enterprise is designed to generate an income for the primary school supported by Manjeri with a view to becoming 100% sustainable and financially independent by 2018. When it is not delivering a local taxi service, the matatu operates as a school bus. Creating a culture of sustainability while improving the bottom line (the matatu contributes $7,500 (11%) of the school’s annual operating budget), the taxi service helps provide high quality, affordable education to a school community of 250 students and staff. Generating weekly revenues while requiring only a light touch in terms of management, the matatu has been so successful that Manjeri plans to scale the business in conjunction with its sustainable education model and expand to a fleet of 3 vehicles. Manjeri is also capitalizing on its TFN experience to ensure that the full benefits will sustain. Within a year, Manjeri’s turnover has more than trebled as the organisation attracted high-calibre board members and in-kind support - increasing its credibility, building capacity and raising overall awareness. TFN pitch coaching also triggered success with other funding sources while connections such as Google Australia (to work on online marketing and external messaging) provided exciting development opportunities. The patron relationships formed and support partnerships established through TFN have brought welcome capital (both financial and social). 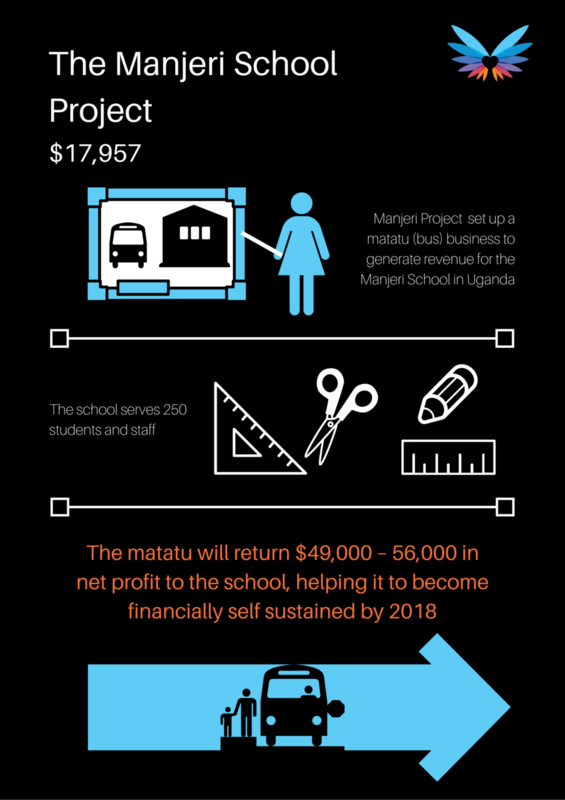 The video footage speaks volumes – in terms of both the impact Manjeri is having in Uganda and the contribution which social enterprises like the matatu (and social networks like TFN) can make. The young team at Manjeri is truly soaring – making plans for the long term, with an expanding view ahead that looks bright. This organisation is no longer in operation.